Cape Canaveral, Florida. January 23, 2014. NASA’s Tracking and Data Relay Satellite L (TDRS-L), the 12th spacecraft in the agency’s TDRS Project, is safely in orbit after launching at 9:33 p.m. EST Thursday aboard a United Launch Alliance Atlas V rocket from Cape Canaveral Air Force Station in Florida. Ground controllers report the satellite — part of a network providing high-data-rate communications to the International Space Station, Hubble Space Telescope, launch vehicles and a host of other spacecraft — is in good health at the start of a three-month checkout by its manufacturer, Boeing Space and Intelligence Systems of El Segundo, Calif. NASA will conduct additional tests before putting TDRS-L into service. The mission of the TDRS Project, established in 1973, is to provide follow-on and replacement spacecraft to support NASA’s space communications network. This network provides high data-rate communications. The TDRS-L spacecraft is identical to the TDRS-K spacecraft launched in 2013. 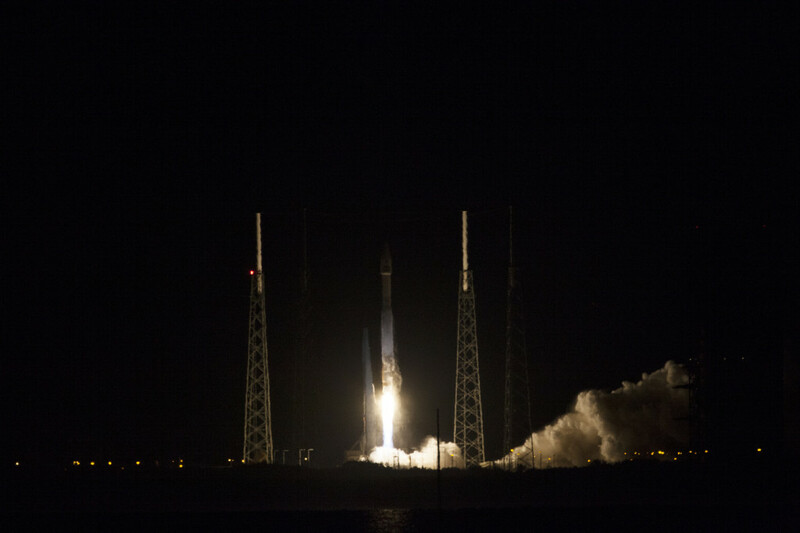 “This launch ensures continuity of services for the many missions that rely on the system every day,” said Jeffrey Gramling, TDRS project manager at NASA’s Goddard Space Flight Center, Greenbelt, Maryland. The TDRS fleet began operating during the space shuttle era with the launch of TDRS-1 in 1983. Of the 11 TDRS spacecraft placed in service to date, eight still are operational. Four of the eight have exceeded their design life. Boeing Space and Intelligence Systems completed the TDRS-L integration and testing at its satellite factory in El Segundo in November and launch processing began after the spacecraft arrived in Florida December 6. NASA’s Space Communications and Navigation Program, part of the Human Exploration and Operations Mission Directorate (HEOMD) at the agency’s Headquarters in Washington, is responsible for the space network. The TDRS Project Office at Goddard manages the TDRS development program. Launch management of the launch service for TDRS-L is the responsibility of HEOMD’s Launch Services Program based at the agency’s Kennedy Space Center in Florida. United Launch Alliance provided the Atlas V rocket launch service.